Situated at the heart of Budhwar Peth, one of the oldest libraries in the city, Pune Nagar Vachan Mandir, even years after, continues to be a major meeting point for intellectuals and scholars of Pune. If you are into Maratha history or interested in conversation about literature, politics and art, this is the place you should be! Built in 1848, Pune Nagar Vachan Mandir was initially formed as the Poona Native General Library at Budhwarwada. 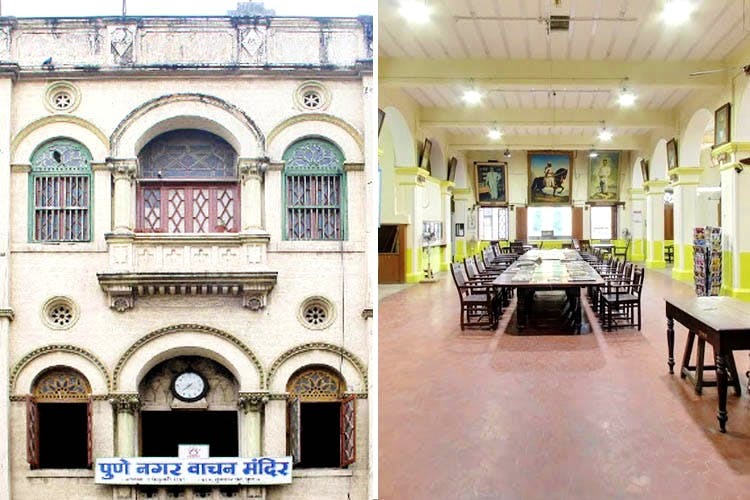 However, when the place burnt away, eminent personalities from the state, Justice Mahadeo Govind Ranade, Lokhitvadi Gopalrao Hari Deshmukh, Krishnashatri Chiploonkar, Prof.Kero Laxman Chhatre, Daji Neelkanth Nagarkar, Vishnu Parshuram Ranade, Sonya Bapu Mande and Vishnu Moreshwar Bhide re-established the library in 1879. Standing tall and proud, this 170-year old beauty, continues to function as a public library in the city, and houses over 50,000 books with more than 3,000 registered members. The thing we love most is that their membership is only INR 30 per month. Members can take home up to three books at a time for a time period of seven days. Once you return the previous books, you can take home more books. There is no restriction whatsoever! In this era of Kindle and social media, surviving as a public library can be tough! Pune Nagar Vachan Mandir has accepted this new wave of change and revamped its model to include an online presence and home-delivery services of books. The old-world charm of this place, however, is not compromised despite the attempts towards modernisation. Visit the library, if you want a walk down the memory lane with its beautiful archaic architecture, the high ceiling fans, wooden cupboards and the smell of very old books. Members, now can call up the library, mention the title and author of the book and get it delivered in no time.